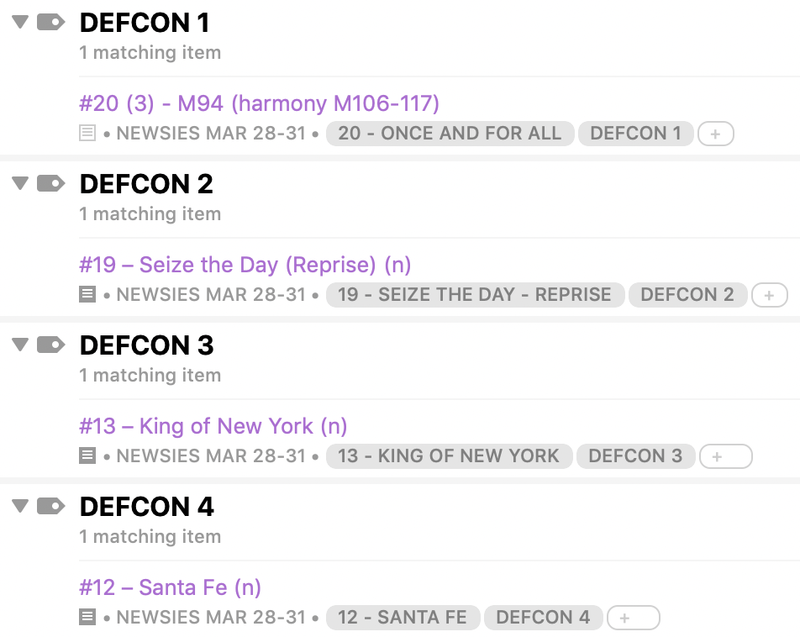 Vince Gassi writes about how he uses OmniFocus to manage learning songs, rehearsing, and directing a musical. It’s opening night. You settle into your seat. The curtain is about to go up. The orchestra sounds great! Soon, you are treated to familiar songs from “Beauty and the Beast,” “The Little Mermaid,” “Mary Poppins” or any number of other wonderful musicals. But the performance is just the tip of the iceberg. What you don’t see is the rest of it: the mountain of detail that is involved in the preparation from day one to the final curtain. Sets, costumes, blocking, choreography. And then there’s the music. As the musical director I spend at least twelve weeks in rehearsal; teaching every harmony part, running songs and scenes countless times. But let’s back up even further. Months before those rehearsals start, I’m learning hundreds of pages of music and dialogue. Throw in production meetings, orchestra rehearsals and… well, it’s easy to see the layers. Not a mountain of detail. More like a mountain range. Oh yes, one more thing. After all of the preparation, there is the added challenge of putting on the same show every night. It’s live theater, things happen. Sounds daunting? I love it! But yes, if I don’t have my act together, if I’m not on my game, it’s going to be stressful. Enter OmniFocus. For me, OmniFocus is a game-changer! Keeping the multiple layers in check allows me to keep vital “psychic RAM” freed up so that when I AM in the game, I can respond intuitively to whatever happens. My current show is “Newsies,” so naturally I have created a Newsies perspective which consists of the various tags I need: Listening, Score Study, Orchestra, People (producers, artistic team etc. ), and Rehearsal Agenda. The first layer of preparation is getting to know the music. Months prior to the first rehearsal, on day one of my process, I simply start listening to the music. Melodies, lyrics, orchestrations, it all becomes internalized through simple repetition. But this can become tiresome. So, rather than trying to listen to the entire show every day — which I used to do, and which, after one week did indeed become tiresome — I commit to just ten painless minutes per day. That’s really only about three or four songs daily. If I start on Monday, by Saturday, I’ve listened to the entire show once (with a break on Sunday). I create a list of the songs in the show (usually between 20-25) in OmniFocus and set the tag for each to “SHOW LISTENING”. Songs 1-3 are set to repeat every Monday, 4-6 on Tuesdays, and so on. I see these reminders in my daily forecast, but it’s even more elegant to see them in my Newsies perspective, grouped under the Listening tag. Either way, I never have to keep anything in my head or think the same thoughts multiple times like, “uh… what songs am I listening to today?” That’s mental stress I don’t need. After three or four weeks of just listening, I switch from just listening to studying the printed music. Using the same action reminders for each song, I simply change the tag from “Listening” to “Score Study.” Again, just three tunes a day (with weekly repeats). During this phase I begin marking up the score with warnings for things like tempo changes, solo entries, cue lines, dynamics, and other expression-related indications. After a week, the score is marked up and I can use the daily reminders to start conducting through all of the tempo changes (still just three songs a day). By the way, in some musicals there are over 200 tempo changes and many of them are so incremental it’s hard to believe the audience would even be able to tell the difference. But they can feel these changes over the course of a song and they do add to the expressiveness of the music. By the time six to eight weeks have passed, I have the music internalized. Capture everything! Process and organize soon after. While I’m studying the score, I mark places in each song where I have to teach the harmony to the chorus. These places turn into reminders under my “rehearsal agenda” tag. So, for next Monday’s rehearsal I know I’m focusing on specific spots in various songs, for example song #3-Carrying the Banner: M163-182 (M stands for measure number). I also tag certain items with a DEFCON rating. Originally referring to the defense alert status (see the 1983 film WarGames), I use them to refer to how critical each song is. Defcon 4 is “this song is in good shape” whereas Defcon 1 is “this song is critical and needs immediate attention.” (n) means that I have production notes in the notes tab. Here’s a recent workflow. I thought it might be helpful to create a group of tags; one for each song in the show. Let’s say I am rehearsing song #7 — The World Will Know. 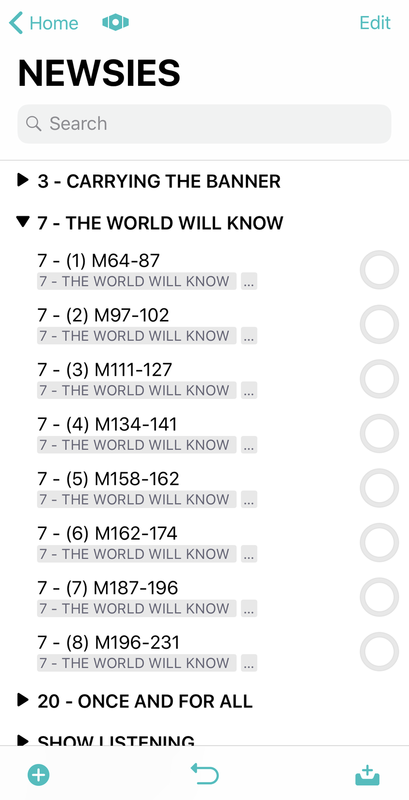 Now, in addition to viewing the “rehearsal agenda” tag, I can also see what I have to do by the “The World Will Know” tag. So rehearsal reminders are now even more elegantly grouped. Due dates are optional. Sometimes I plan out a future rehearsal. A defer date will hide the reminders until I need to see them. Sometimes I leave them without due dates just so I can see upcoming rehearsals at a glance. Here’s the cool thing. 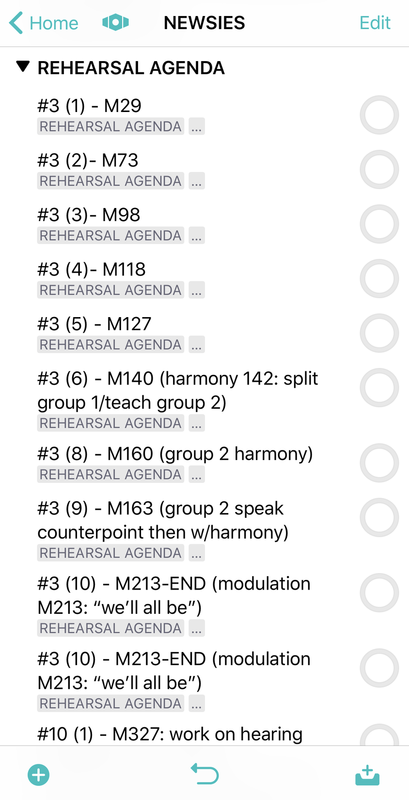 Looking at my Rehearsal Agenda tag, if there are any items I am not able to complete, say item #8 (M196-391), I remove only the Rehearsal Agenda tag. This reminder now only appears in the song tag. So, for my next rehearsal, I review my Rehearsal Agenda and if I have extra time, I can then have a look at songs with uncompleted items. I also include one rehearsal at the end of the month that is simply labeled on the schedule as “WHATEVER IS NEEDED.” This would definitely include those unfinished items only showing under song tags (e.g., THE WORLD WILL KNOW item 8). This may sound somewhat complicated; however, the complexity is in the setup (OmniFocus’s strength). The depth of OmniFocus allows me to keep things looking simple and elegant when I’m in the game. When I want to see the big picture, I look at the rehearsal agenda which has every item of every song for the upcoming rehearsal. 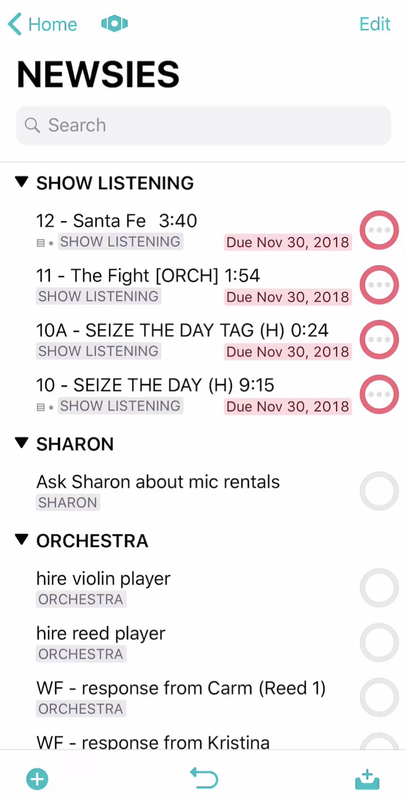 When an action reminder is completed, I tap the circle and it is removed from both the rehearsal agenda tag and the individual song tag/list. If I don’t get to it in rehearsal, I remove the rehearsal agenda tag only so that list stays current and uncluttered, but the item remains in the song list to remind me what still needs attention. I have also created a Music Direction template. So, when I am starting a new show, say “Beauty and the Beast,” I activate that template. It contains things like a listening schedule template with repeating due dates, reminders to change the show dates, creating mic lists, orchestra lists etc., setting audition and rehearsal dates, reminders to take attendance, purchase thank you cards, buy treats… it’s endless! The listening schedule looks like this. 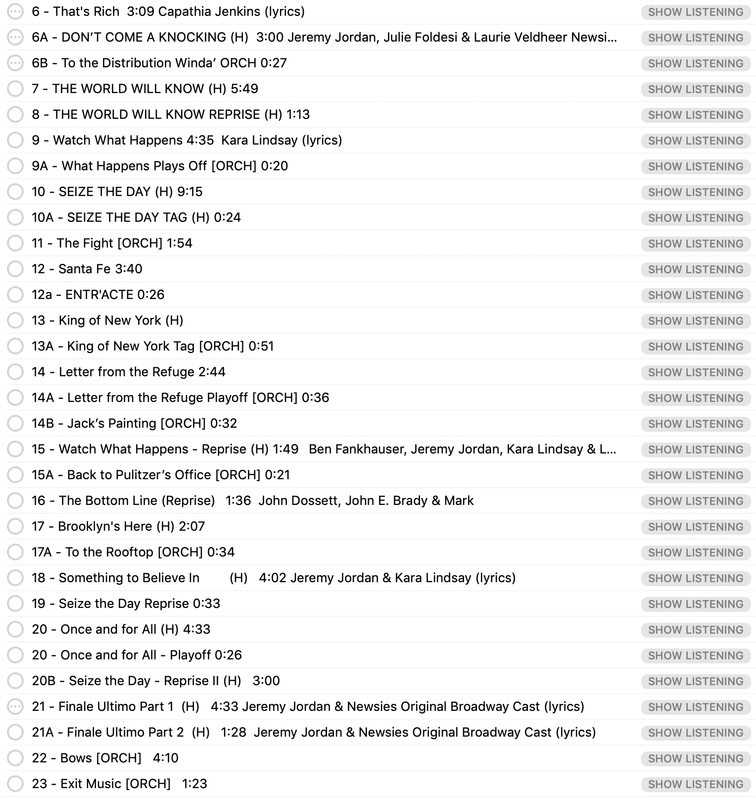 Notice I include the song number from the libretto as well as the duration of the song (2 -PROLOGUE/SANTA FE (H) 4:43 Andrew Keenan-Bolger & Jeremy Jordan (lyrics). I also like to include the names of the actors who starred in the Broadway production. It makes me look like I really am current and up on who’s who. “H” means this is a song with 2,3, or 4-part harmony (which will factor into how I structure the rehearsal schedule). (a) tells me there is an attachment and (lyrics) reminds me that I have the lyrics to the song pasted into the notes section of the reminder. For a week or maybe two, I tap “select all” and tap “speak” so while I’m out and about, I can put in my Air Pods and review. In rehearsals and performances, I have the musical score in front of me and a script to my left. Yes, the musical score does include the dialogue cues but I like to have the entire script handy. Sometimes there are many pages of dialogue between songs; other times not so much. It might be a little too fussy, but I mark up the script pages with a number at the top right or left corner of each page to let me know how many more pages of dialogue there are before the music has to start. Of course, I simply copy the song list from my listening template and paste into a subfolder in OmniFocus called “SCRIPT MARK UP.” This is also included in my Musical Direction Template. So, it only had to be copied and pasted once. Having workflows that get us up to speed fast makes our jobs as music directors much less stressful. Nadia Boulanger — whose list of composition students included Igor Stravinsky, Aaron Copland, and Leonard Bernstein — once said, “Life is denied by lack of attention, whether it be to cleaning windows or trying to write a masterpiece.” Lack of attention? There are terabytes, mountain ranges of detail that need a musical director’s attention. The conventional wisdom is “Don’t Sweat the Small Stuff,” suggesting that this level of preparation requires too much time and effort. Before OmniFocus, I used to go with the flow and just wing it. The result? Show nightmares! They were always the same. I’m in the pit, in the middle of a scene. It’s dark and I can barely see a thing. Not even the score. I know I have to bring the orchestra in soon but I don’t know the cue line. Worse, I don’t even know what song we are on. And — like those dreams where you’re falling and you wake up just before you hit the ground — I wake up just before the singer starts, and I’m in a cold sweat, heart pounding. I can’t afford not to take the time to prepare this way. The confidence and peace of mind it affords me is invaluable. OmniFocus allows me to keep my focus on what’s important: getting all the details handled so that when I’m in the pit on opening night, I can focus on running the show. Vince Gassi is a much sought-after composer, conductor, and clinician. He’s currently pursuing a Ph.D. at York University in Toronto, Canada. Visit his website, vincegassi.com, for more details — and to hear some of his music!